Satya Cashew Chemicals (P) Ltd., products are used in applications where safety, environmental concern & protection are a key criterion. Our products enhance safety and performance in critical applications like brake linings, disc pads and clutch facings. 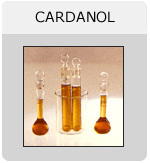 Cardanol's chemical structure contributes flexibility, chemical resistance, adhesion and greater hydrocarbon tolerance in the resins prepared from it. Cardanol is used in surface coatings, epoxy, varnishes, paints, printing inks, phenolic resins, rubber compounding, lacquers, laminates, friction materials, and adhesives.